Address: 22 A Ta Hien St., HOAN KIEM DIST., HANOI, VIETNAM. Our hotels were designed and built with high architectural standards and qualified by Vietnam Administration of Tourism. All rooms have private bathroom with hot shower, air-conditioner, IDD telephone, cable TV with many international channels, mini bar, ADSL internet connection....Many rooms have also electronic safe and personal computer in room. Located in very convenient place for visiting all the surrounding tourist attractions and shopping areas with luxury rooms, professional service, friendly and helpful staff the hotels have been recommended by many travel guide books like: Lonely Planet, Rough guide, Japanese guide book, German guide book, Swiss guide book, Korean guide book, Russian guide book, Thai Guide book...and many magazines, websites, newspapers. We guarantee that your stay in our hotels will make your trip in Vietnam unforgetable. Classic Hotel is located in TaHien Street, one among the 36 ancient streets of Hanoi.It has an architectural style and interior decoration of charming national and Oriental character. All the hotel rooms are spacious and confortable with modern equipments of international standard creating an atmosphere of elegance and nobility. Staying at the hotel, you will find it extremely convenient for their contact with cultural, commercial, touristic ..From the hotel,you would only need a few minutes walk to travel around th Sword Lake with its ancient Turtle Tower and the NgocSon temple, symbols of Hanoi, or to reach the largest Hanoi trading center. Staying at hte hotel, you will all feel satisfied with the hospitality and the careful service of qualified personnel who will leave in your heart the best of impressions. 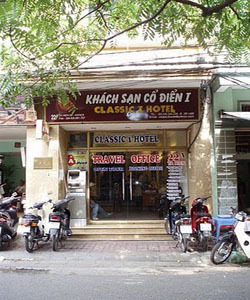 Classic hotel is your ideal resting place for your arrival in Hanoi.